If you see the message “Secure connection is not available” when attempting to establish a secure connection using Kaspersky Secure Connection, restart the application. 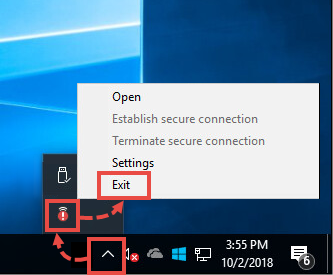 Right-click the Kaspersky Secure Connection icon in the lower-right corner of Desktop and click Exit. If the icon is hidden from Taskbar, click the Show hidden icons arrow first. Try to start a secure connection once again. If restarting the application didn’t help, try to start a secure connection once again. If the error persists, submit a request to Kaspersky Lab technical support via My Kaspersky. Please include a detailed description of the issue.